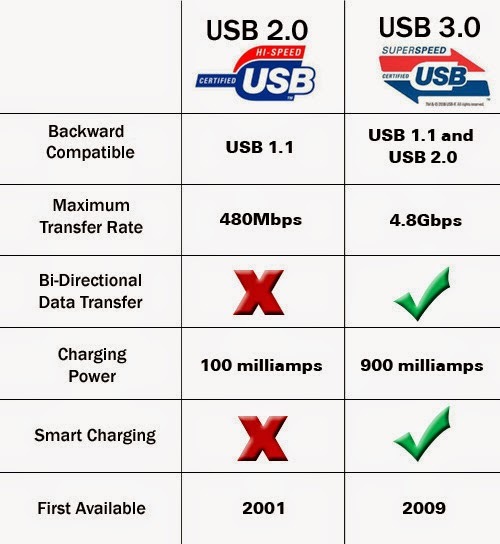 How fast is USB 3.0 compared to USB 2.0 and other technologies? tablets and peripherals connected via USB 3.0.
more quickly, without the need for an external power source. What are the major technical changes that enable these benefits? enabling bi-directional data transfer and the ability to read and write data simultaneously. which is backward compatible with USB 2.0 devices. Will current USB 2.0 products work with the new USB 3.0 ports? Is USB 3.0 available in laptops today? USB 3.0 ports are usually highlighted by a blue plastic tab and/or a Super Speed logo. the speed and efficiency of these practices. enhanced speed and power output. monitors for increased worker productivity of up to 50%. What peripheral products are available today using USB 3.0? No Comment to " ALL ABOUT USB 3.0 FREQUENTLY ASKED QUESTIONS "